As a Muslim, I fast for a month every year, during the lunar calendar month of Ramadan. 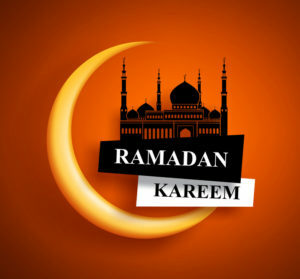 Ramadan is considered the holiest month of the year for Muslims. It is a time for fasting and praying. Muslims all around the world fast from sunrise to sunset. At the end of the month we celebrate the holiday of Eid. Ramadan is always a bitter-sweet time. I love the feeling of festivity in the air. Muslims everywhere join together to break their fast at sunrise. My mom and I typically spend the afternoon preparing a feast for the family, and frequent guests. During the evening, we all go to the mosque for a special night prayer, which we typically only pray during Ramadan. The feeling of serenity hits from the moment I walk into the mosque. The voice of the imam, the person who leads the prayer, fills the air. But of course there is the fasting. The first week of Ramadan is always the hardest for me when it comes to the fasting. I go from eating whenever I’m hungry to not being able to eat all day. This is especially rough when Ramadan is in the summer, or when I’m on vacation in a country where the weather is hot, because one is not allowed to drink water while fasting. Last year I was visiting Sudan during the last week of Ramadan. The weather was very hot so it was difficult to fast. All I can remember doing was waiting until sunset to be able to chug down a jug of cold water. Fasting for the rest of the month gets easier as it goes. By the last day of Ramadan, I am so accustomed to fasting it is almost hard to get out of the routine once the month is over. Fasting during Ramadan is supposed to remind Muslims to humble themselves — to think of the less fortunate and how they’re suffering. Fasting is also supposed to help one practice self-restraint—to resist one’s desires, and to learn to control one’s self. I am so excited for Ramadan this year. I am eager to be in a constant state of calmness. I am excited to wear my long black dress, and go to the mosque at night where I can meet up with my friends. It is still two months away but I am already in the Ramadan spirit!